This fast-moving thriller is also a surprising celebration of survival. Gary D. McGugan’s Three Weeks Less a Day is an international thriller whose protagonist is a breast cancer patient, though his illness is only one of many twists and turns. This fast-paced caper examines greed, power, and high-stakes quests for control. Billionaire John George Mortimer built his company, Multima, from scratch. It is one of the largest, most profitable corporations in the world. Still, money can’t keep disease at bay, and Mortimer’s billions can’t buy him remission. A cancer diagnosis leads Mortimer to question whether he should continue leading his company. While looking for a successor, Mortimer stumbles upon organized crime and corporate mismanagement at every level. Throughout the novel, he makes more and more unexpected discoveries of deception involving those at the core of his company, forcing him to decide whether fighting greed is worth the effort when his health is on the line. A fascinating section explores alternative medicine and therapies for dealing with cancer, using one character’s meeting preparation to discuss a book that details correlations between diet, exercise, lifestyle, and overall health. The discussion impacts not only the company, but ties in to Mortimer’s own struggles. McGugan weaves such fascinating information throughout the text, and these moments impact more than one storyline. It’s not often that a male protagonist is fighting breast cancer. Witnessing his daughter’s and male friend’s successful battles with breast cancer inspired McGugan to spread awareness about the disease. The illness is certainly a strong component of Mortimer’s persona and influences how his inner-circle executives interact with him, but cancer does not always take center stage. His struggles are a deft illustration of the idea that cancer is not always a death sentence, and that patients can continue to battle life’s demons while fighting it, too. The thriller takes apart stereotypes around men and breast cancer, presenting a relatable character who charges from one situation to the next with grace and aplomb. Events zip by in a flurry of well-timed action, dialogue, and narrative flow. 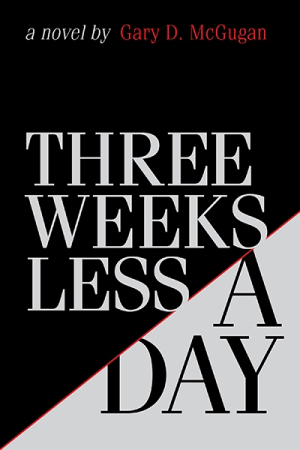 Three Weeks Less a Day is thriller that conveys a surprising celebration of survival. It is a testimony that cancer patients can overcome adversity, whether it’s in the boardroom or at the doctor’s office. As the old adage goes, where there’s a will, there’s a way, and this book offers great hope that a little willpower and perseverance can help anyone achieve great things.